In today's Technology Today, we chat through how MetaCert's new software is catching phishing links in emails. 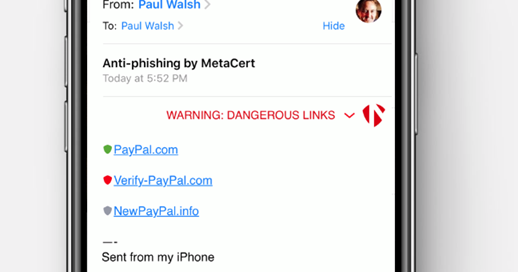 MetaCert, founded by Paul Walsh, has released it's NEWEST product launch Beta - the best anti-phishing security, for emails on you iPhone. It will display green or red shields to inform you whether or not the link is fake/harmful. Red is obviously fake/harmful, while green means that it is a valid link. Walsh is also working towards creating similar software to identify and mark fake news. Funding for this project is currently underway. Are you excited for this NEW, helpful software? Do you feel that utilizing Beta will put your mind at ease to phishing? Sound off, below.